Well, it’s been a awhile since I’ve posted. Sorry about that, but it’s been the season of the Doldrums. Not fully winter with all its beauty and not fully spring with all it’s beauty. That in-between stage with lots of mud and rain and mud and warmish today and back to freezing tomorrow… you know. And then we had that slide a few weeks ago that cut us off from town. So today, since they have the higher route plowed and open (it’s usually closed for the winter) we decided to go to Redding. The view from the top almost makes the trip worthwhile. We truly live in a beautiful country. I only hope we can keep it that way. Between SP & the pot growers clear cutting and spraying defoliant. 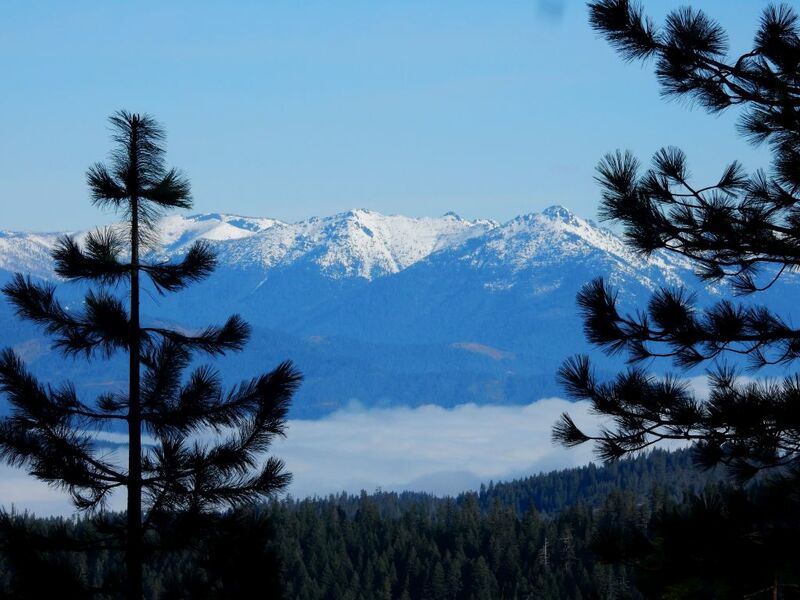 It was a sea of fog in the valley, but the ‘sea’ looks very different from above. Looking back west toward Billy’s Peak and home. That’s the last peak there on the right. We live at the foot of it. Looking east we can see that Mt Shasta has a nice white covering, too. 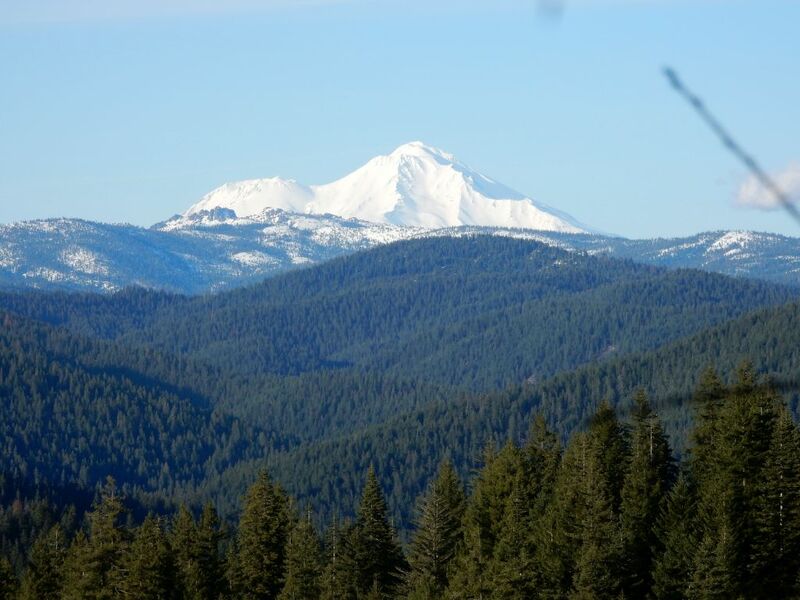 Elevation for Billy Peak is 7275′, while Shasta is 14,180′ which will explain the difference in the depth of the white part. But in town I got some new yarn, which Jane Grogan (Teacher from Wisconsin) pointed me to. It might be interesting, at least. 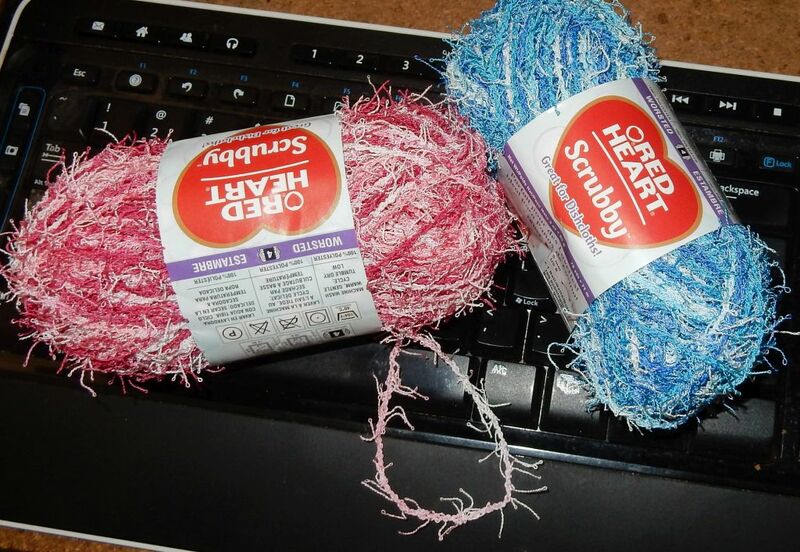 It’s a Red Heart yarn called “Scrubby” and is supposed to make face washers and pot scrubbers. I have a hard time imagining one for both uses! lol My face gets dirty, but not, I hope as dirty as my pots and pans! Well, I will weave up a couple today and give them the Test and let you know what I think about this. I think Red Heart is taking this opportunity to turn it’s reputation for scratchy acrylics into a virtue! The sun is out this morning and the primroses, daffodils and forsythia are blooming. The weeping willow is leafing out and the buds on the peach are getting fa,. signs that spring may arrive after all! Hope you are getting those good signs where you live as well! A little follow- up on the new yarn. I wove a couple on the 3 1/2 inch Tiny Weaver square. It a little tricky to weave, as are most fuzzy yarns but not too hard. I wove two and sewed them together back to back to make a thicker pad. I have to tried it out yet but just the feel of it on hand and face, I’d say, yeah you can wash dishes with it but calling it a scrubby is a bit misleading. If you burn the lasagna you’d better just get out your steel wool as this little pad is not going to be up to that job. As for washing your face… Well, I don’t think I am particularly tender but it feels a bit harsh for that job. I might weave one on the 7″ and it should wok pretty good for scrubbing my gardening hands. All in all, I think making a bigger pad and using it for regular dish washing is probably the best use for this yarn. But you judge for yourself. It’s an inexpensive one.